Many mistakenly believe that “pet-proof” is code for “absence of style”, but this is simply not true. You can beautifully outfit and remodel your home to be completely pet-friendly, simply by using specific paints, flooring, fabrics and furniture. And these days, there are more options for pet-loving consumers than ever before. Hard surfaces tend to work better than carpets for several reasons: carpets trap odors and allergens, and are more challenging (not to mention expensive) to clean. Hardwood floors, such as hard oaks, hickory and maple, are highly durable and easy to maintain. Ceramic tile, sealed stone and stained concrete are also excellent flooring choices for pet-friendly households, as these surfaces are very hard, hold up well to traffic, are easy to maintain, and are offered in a wide array of attractive styles and textures. If you prefer carpet, use cut-pile and avoid styles featuring loops as they can snag on nails and teeth. Select a stain-resistant carpet with a medium-to-high manufacturer’s durability rating. And, since “accidents” are a fact of life, especially when housetraining, make sure that you install a carpet pad with a protective spill barrier to prevent lingering, unpleasant odors. Dog and cat lovers take heart! 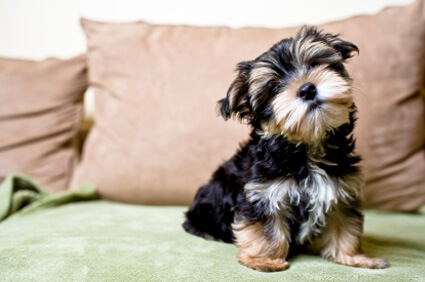 There are loads of high-style fabrics that are surprisingly pet-friendly. Both crypton and ultrasuede are chic, durable and easy to clean. Crypton is stain-, water-, and bacteria-resistant. And ultraseude is resistant to both stains and odors. Furthermore, ultraseude is wonderfully resilient – scratches don’t leave a mark and fur won’t become matted into the fabric. Another option is pleather, which is a cruelty-free alternative to leather that doesn’t scratch or stain, and spills wipe clean with a sponge. Or, for a more affordable option, simply protect your existing furniture with a modern slipcover. Look for one that’s easily removable, machine washable and made of heavy, durable fabrics, such as canvas or denim. One last rule: absolutely no velvet anywhere, as it’s well-known as a “hair magnet”. When choosing furniture and rugs, remember that neutral colors – such as taupe, cream, khaki and gray – don’t highlight dirt and hair as badly as darker colors. It’s probably best to avoid keeping anything white near the floor (and accessible to companion animals), as even white leather can become stained and scratched. When it comes to selecting paints, you’ll need one that’s washable. I recommend a satin finish because it resists marks, helping to keep your wall color looking fresh and clean compared to other finishes. Furthermore, I recommend low- or no-VOC (volatile organic compounds) paints to protect you and your companion animals from toxic fumes. If you have problems with your pets jumping up on furniture to look at the window, consider revising the layout of the room in question – problem solved! If you’re looking to replace tables, find ones that are sturdy and weighted tables, as they will be less likely to topple over when bumped. And keep those knick-knacks and valuable pieces out of reach of paws and jaws, like up on a mantle or bookcase. If you are redoing cabinets, consider installing a five-drawer cabinet … use the bottom drawer to house food bowls. When meal time is over, simply close the drawer and hide the mess. You can also repurpose pull-out trash drawers to store pet-food bags for convenience and clutter reduction. If you have a family member who suffers from pet-dander or pet-hair allergies (See Post - “Can Kids with Allergies have Pets?”), design the home to minimize exposure to dirt, dust and allergens. Use hard surface flooring, vacuum often (the best vacuums feature a HEPA filter), install a HEPA furnace or central air filter, and minimize the use of textiles, such as carpet, window treatments and upholstery, all of which can trap allergens. I also recommend reducing clutter as this minimizes dust and allergen accumulation and makes cleaning easier. Households with companion animals need storage space and organization. Find a unique and fashionable storage bin for your pet’s things, like a wicker basket or a vintage trunk. This simple fix can make for easy clean-up and it’ll look posh to boot. I wish you the best of luck in your pet-friendly redesign, and hope that you and your companion animals are more comfortable and happy in your revitalized home environment. Love the tips. We have hardwoods and carpet and we schedule to have someone clean our carpets 2x a year. We have throws over our furniture and have taught the dogs "go to your blanket" and "get on your blanket." The throws are really nice, are for pets, and are less expensive then people throws - funny. There are some fascinating points in this article. Thanks, looking forward to more excellent posts!